Team ICO is still hard at work on the much-delayed, PS3-bound title. Sometimes it's hard being a prospective The Last Guardian fan. With an original launch window set for somewhere around the winter 2011 mark, the spiritual successor to Ico and Shadow of the Colossus has had what seems like a rocky few years in development. Several no-shows at large industry events, combined with staff troubles and other quasi-concerns, have left some fans in sorry, slightly panicked state. So should they be worried? According to Sony Worldwide Studios head Shuhei Yoshida, the answer to that question is a negative. 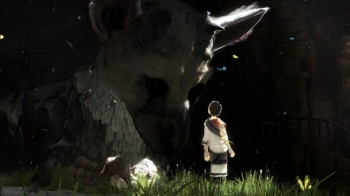 Speaking with gaming site Eurogamer at Gamescom this week, Yoshida was quick to remind onlookers that, despite any worries, The Last Guardian is still an ongoing project. "The team is still working on it very hard," said Yoshida. "There are certain technical issues they've been working on. That's the period of time when the game, looking from the outside, doesn't seem to be making much progress. But internally there is a lot of work going into creating the title." What was with that whole 2011-release-actually-wait-no incident, then? According to Yoshida, "We had the game playable...At one point we felt that it would be produced for a certain time period. That was the time we prematurely talked about the launch window. But it turned out the technical issues are much harder to solve. So the engineering team had to go back and re-do some of the work they had done." Yoshida concluded by saying that The Last Guardian, despite PS4 rumors to the contrary, remains in development for the PS3. For a reminder of how gorgeous the concepts for this game are, and perhaps the reasons behind why engineering it correctly is proving to be such a trial, here's a link to that stunning trailer from 2009. The giant bird-bat-puppy who stars in the trailer looks pretty chilled out; maybe we should take a collective page from his book regarding future news about this game.